Hello all, Andrew Doughty from Next Impulse Sports here with a fantastic PM Hot Clicks. Feel free to follow me on Twitter for daily bits of wisdom. 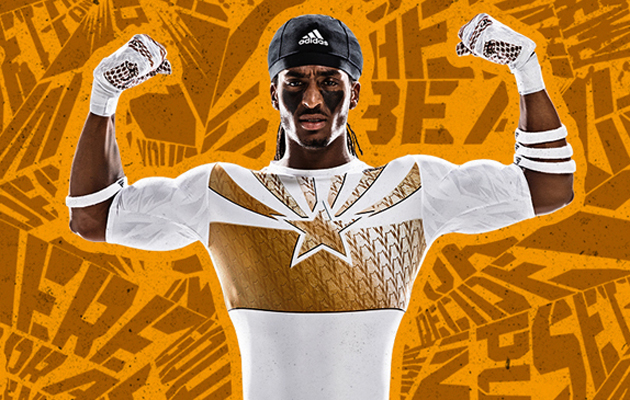 Arizona State and adidas introduced "Desert Ice" digs for the Sun Devils monster Sept. 5 season opener against Texas A&M at AT&T Stadium, and while the jury is deliberating on the new unis, we can all agree that Nike nailed it with some slight, but effective, alterations to Michigan State's alternates. In other uniform news, Paul Lukas of Uni Watch recently put together an interesting list ranking the best two-team cities based on uniforms. Meanwhile, Fansided has put forth its own ranking of the 10 ugliest NFL uniforms of all time. This story from Wellington, New Zealand is heartbreaking and heartwarming... just read the story and watch the video. Don't ask questions. Western Michigan got creative in telling running back and special teamer Trevor Sweeney that he would be placed on scholarship. These videos never get old. This 10-story, 80-foot long "Sky Pool" in London is one of the coolest and most terrifying pools you'll ever see. I'll stick to swimming pools that don't cause my blood pressure to skyrocket. Check out this heart-pumping hype video for 6-man Colorado high school football team Arickaree/Woodlin. You're not a football fan if that doesn't get you jacked up for this fall. LeBron went to Manila and dominated an amateur basketball game by throwing down a bevy of high-flying dunks, including this puppy. Mike Miller and Shaq were in Hong Kong promoting Miller's new energy drink and decided to have a three-point shooting contest before an exhibition game.